Really hot in Gib today 30degs..Roy has his family her 3 grandkids and Daughter...so very tiring... Kids are great ...but you get out out it when there is just the Two of you ...Roy is in a Sailing Regatta today and tomorrow...so they will do there own thing ...and so will i ..??? Penny Black Stamp ...love this one .. Wanted to but couple of Gems on ..But could here Mandi and Chrissie saying no!!! !Enjoy your Day...thanks for looking..and thanks for all my Fabby comments last week.. Such a sweet card Sylvie! I love those little mice. What a fab image, love your card, just perfect! Aww this is such a sweet card! Love the adorable image and the red lace border under the image panel. 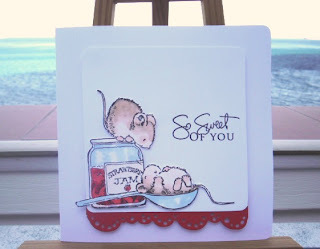 This card has reminded me that I have a super PB stamp with a bowl of cherries that I had forgotten all about! Your card is simply as gorgeous as ever. Hi sweetie this is just fantastic hun I really do love this one.....its gorgeous. Wow you really do do these cards so well & you make them look so easy......its not fair lol. I wish I could get my blogger to work for me. It's a lovely card and I just love those mice!! So sweet and isn't your cutting out just fabulous? Another gorgeous card, love the fun element in this and that fat little mouse. Hola sylvie, thank you for your visit to my blog. Oooooh Sylvie...sweet, sweet, i love this stamp, beautiful card!fantastic colouring. what a sweet card, sylvie!! Love your LIM cards Sylvie...very cute image..love the wee guy in the spoon, fabulous colouring. Fabulous card - really cute image. The view from your balcony is as wonderful as ever !! such a lovely card perfectly created as usual and a lovely happy image. Fabulously sweet and fruity card Silvie. Very nice card and the sentiment is just perfect. Love this one, great card as usual. Fabulous Sylvie.. just love it! gorgeous card with these 2 cute mices, perfect way to feel fruity! Fab card, great image & colouring, like the bottom red border. What a cute card...love the penny black image...the mice are adorable!! That PTI set of sentiments is one of my very favorite and perfect for this challenge and your card:)!! Your card is brilliant I love those little mices!! !